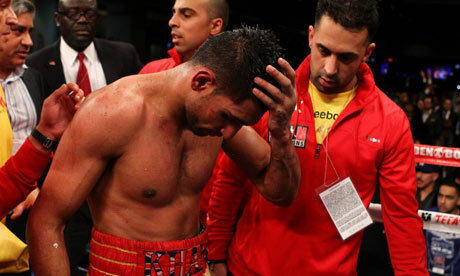 Amir Khan has alleged a mystery man interfered with the judges scoring during his controversial points loss to Lamont Peterson. Khan has taken to Twitter to post a series of messages, videos and pictures to back up his claims. Now this whole thing to me still smacks of desperation from the Khan camp but for once he might actually have a point here. Hopefully we will get an answer to this whole thing very soon because IF it is true then it is a shocking end for boxing in 2011; a year that had some its fair share of questionable scoring (Murray-Sturm, Macklin-Sturm, Pacquaio-Marquez and Chisora-Helenius). But view the slideshow and video below and judge for yourselves but please keep this in mind; if the decision had gone in Khan’s favour and Peterson was crying foul would Khan care? Or even consider a rematch? Skip to 8:46 for the start of the fight. What does everyone think? Does Khan have a point? Or is he just clutching at straws? 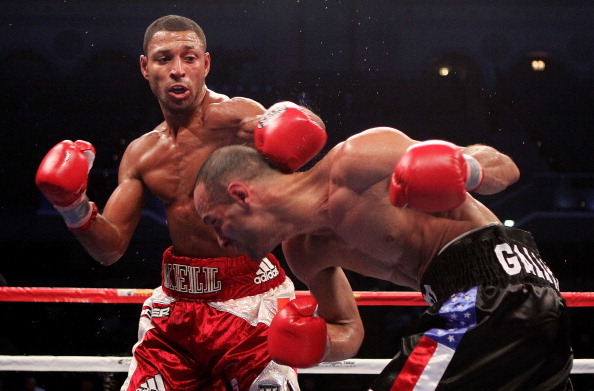 Kell Brook has given British boxing a timely boost following his impressive American debut. Brook produced a controlled performance to dispose of the durable Luis Galarza inside 5 rounds on the Froch-Ward undercard. The Sheffield native was in complete control throughout the fight, despite being caught once or twice, and almost had the contest over in the first round. Brook landed a big right hand followed up by a spiteful jab that had Galarza stumbling, only to be saved by the bell. “Special K” showed good patience throughout the next few rounds and boxed smartly, landing fast combinations and breaking down his opponent with a hurtful jab. Brook finally got rid of Galarza in the 5th. He landed a big right hand which pushed the Puerto Rican back onto the ropes before unleashing a flurry that forced the referee to call a halt to the contest. In all honesty, the stoppage was perhaps a tad premature but it was only a matter of time before Brook knocked Galarza out and the referee did the right thing to prevent any further damage. Now we all know this was just a showcase fight for Brook; a chance to impress on his American debut, which he did. But now is the time for Brook to step up his level of competition. Brook is in a very odd position as he is ranked the number 2 welterweight in the world by the WBO, the title that a certain Manny Pacquaio holds. I’m not suggesting Brook seeks a fight with Pacquaio (because he’s nowhere near ready) but a fight against someone ranked in the top 10 is a must. Maybe a Paulie Malignaggi or Devon Alexander would give us a chance to see whether Brook is good enough to challenge for a world title. Now some people might scoff at the idea of Malagnaggi but this guy is a good pro, a good opponent and in the permanent role of “boxing gatekeeper”. Malignaggi has already called out Brook via Twitter, saying that if the price is right he’ll fight him in the UK. This is a fight that has to be made. Following the despair of the Carl Froch fight, British boxing might just have a new superstar on the horizon. Time to step up: Kell “Special K” Brook. Matthew Hatton lost a unanimous points decision to unbeaten Mexican Saul Alvarez for the vacant WBC light-middleweight title. The younger Hatton failed to follow in brother Ricky’s footsteps and bring a world title back to Britain as he was easily out-classed by the highly rated youngster. Hatton failed to win a single round on any of the judge’s score cards, as Alvarez became the youngest ever light-middleweight world champion. The Golden Boy prospect certainly had an easier time of it in the ring than he did out, as he originally failed to make the required weight which certainly would have embarrassed promoter and former fighter Oscar De La Hoya. But once the weight issue was settled and the fight got under-way there was only going to be one winner. Alvarez was too big and too powerful for the Mancunian, who had stepped up in weight – and class – to take this fight, has now admitted he will look to drop back down to his natural weight. The Mexican was in complete control from round one as he landed a series of flurries to the head of Hatton to set the tone for the rest of the fight. He bloodied Hatton’s nose during the second, following another series of head shots which cause his face to mark up. 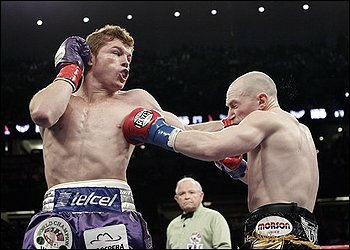 Alvarez – nicknamed ‘Canelo’ – continued to dominate Hatton throughout the rounds, opening up a gash above his left eye during round four with his precise punching. The only real blemish for the young powerhouse – inside the ring – came in the seventh when he was docked a point for an illegal blow as he punched out of the clinch, which resulted in Hatton dropping the canvas. Despite that setback the round was still scored a 9-9, showing how dominate Saul Alvarez was in picking up the WBC light-middleweight title vacated by Manny Pacquiao. Matthew Hatton will now look to drop down a weight and hope to gain another world title shot.